I have been casually obsessed with acai for about three years now. I love adding the sambazon smoothie packets to my ever changing green smoothie recipe. Not only do I feel extra healthy when I add this frozen packets, but the sweet tart berry taste covers pretty much any gross green flavors I add to the smoothie mix. Now that you understand my love for these packets and know that I buy them in bulk at Costco (at least 20 packets a month, don’t judge! 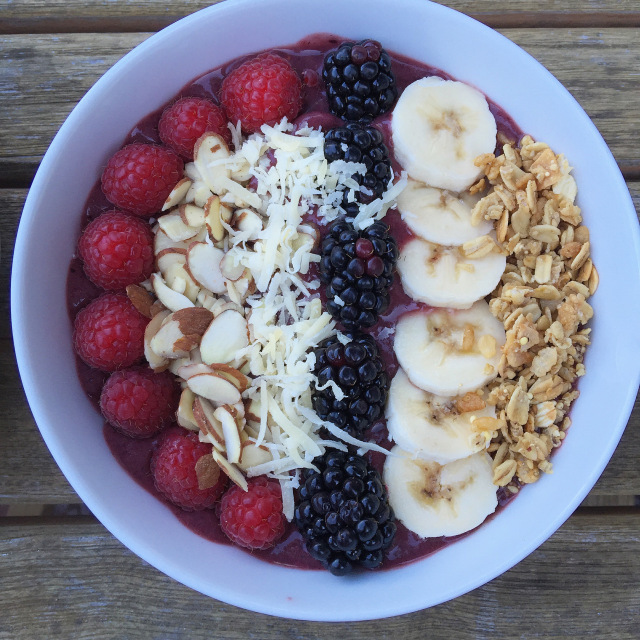 ), it was only a matter of time until I discovered the next level of acai – THE BOWL! 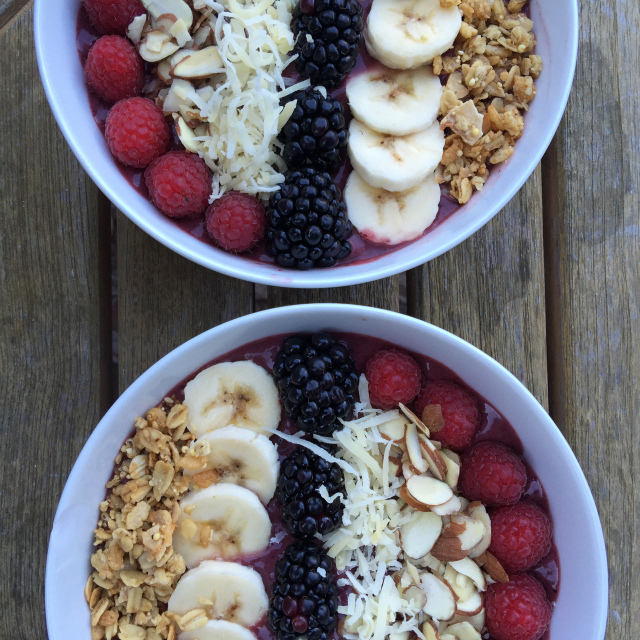 I’ve enjoyed the culinary delights of an acai bowl several times at various southern California cafes, but up until now I hadn’t tried creating a bowl of my own at home. Let me tell you it took me a while to find the perfect ratio for a creamy yet, solid base, do not follow the acai bowl directions on the back of the sambazon bag – you will just end up with a soupy, smoothie mess. Feel free to update your bowl toppings based on your preferences and seasonality, of course! I love everything about this recipe, especially because the combinations are endless. Combine the acai smoothie packets, almond milk, 2 bananas and frozen fruit ingredients in your blender and blend until smooth and creamy; the mixture should be thick. Even my vitamix had a difficult time powering through. Add 1/4 cup of granola to the bottom of each bowl and sprinkle with one Tbsp almonds each. Divide smoothie mixture on top of the granola almond mix in each bowl and top with the remaining toppings. Enjoy immediately, because no one likes a melty bowl.